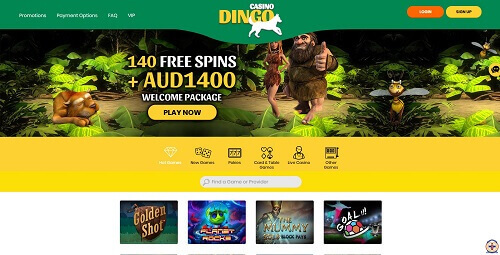 Casino Dingo is a relative newcomer to the online casino scene in Australia, having been launched earlier this year. This tends to make some players nervous, so we sent the Casino Aus review team to have a look. After outing it through our rigorous review process, we’ll be able to tell you if this online casino is a hit or a miss. There are also numerous other promotional offers. These include reload bonuses, cash back bonuses. This ensures existing players never feel left out. Customer support is available 24/7, as you’d expect from today’s casino sites. Players looking to get in touch with support can do so via email or live chat. Casino Dingo is supplied by a few different game developers. These include Mr Sloty, Booming Games, and Fugaso. These developers aren’t as well known as some others, but it does mean that they have unique games that you’re unlikely to find elsewhere. Casino Dingo has over 150 pokies available, plus numerous table games. These include the likes of Keno, Baccarat, Roulette, and Blackjack. There’s also a Live Dealer casino with Blackjack, Baccarat, Roulette, and Casino Hold’em. Players can easily access Casino Dingo from anywhere in Australia using their mobile devices. Whether you want to gamble on a smartphone or tablet, you simply need to visit the site from your device and log in. There is no additional software needed, just log in and play. Players concerned about safety shouldn’t worry as all the games are regularly checked by Gaming Laboratories International (GLI), an unbiased, third party. These checks ensure the games are fair and not rigged. In addition to this, Casino Dingo is fully licensed and regulated by the appropriate authorities. All in all, Casino Dingo makes a very good impression for a new online casino. It has a good number of games, including unique titles you won’t find at most sites. It is safe and fair and offers a very competitive welcome bonus. Plus, there are Live Dealer games. We give it a well deserved four out of five stars.